Why there was no warming from 1998 to 2013? 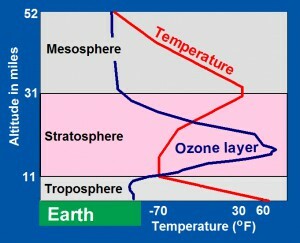 The troposphere is heated from below by Earth’s sun-warmed surface, so that average air temperatures (red line) decrease from near 60oF at Earth’s surface to -70oF at the top of the troposphere. Heat is convected up through the troposphere by hot air rising and by wind, driven by horizontal differences in temperature. In the overlying stratosphere, however, air temperatures rise upward. The stratosphere’s upper layers are strongly heated by solar ultraviolet-C (UV-C) radiation, which is energetic enough to dissociate molecules of oxygen (O2) into pairs of oxygen atoms (2O) that combine with molecules of oxygen to form ozone (O3). 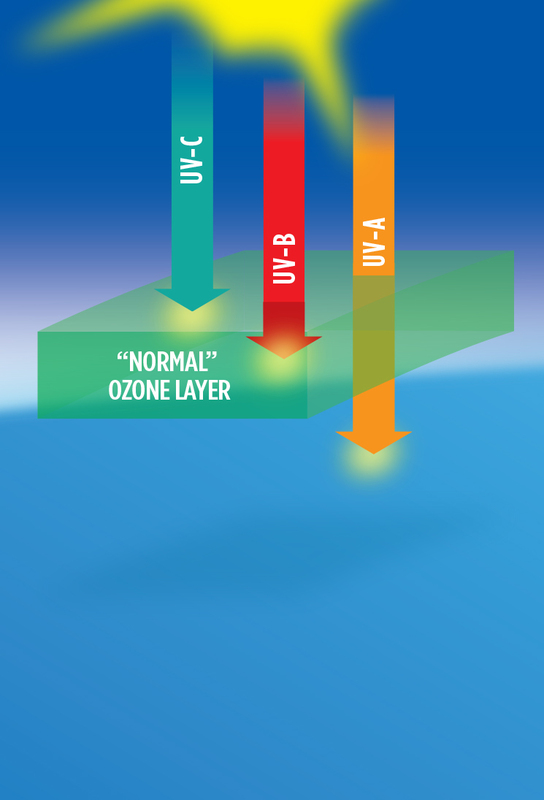 In the lower levels of the stratosphere, solar ultraviolet-B (UV-B) radiation dissociates ozone (O3) back into molecules of oxygen (O2) and oxygen atoms (O). This process also releases heat, and together, the two processes maintain temperatures at the top of the stratosphere close to 30oF, which is 100oF warmer than temperatures at the base of the stratosphere. Above the stratosphere is the mesosphere, a region of cooling, where the Earth-stratosphere system loses heat into space by radiation. 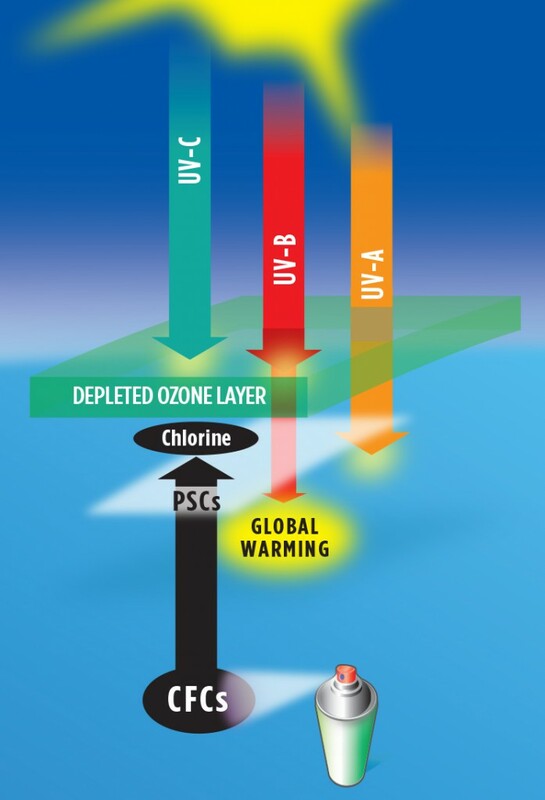 The ozone layer, then, is a region of the atmosphere in which, during the daytime, ozone is continually being created by solar UV-C radiation and destroyed by solar UV-B radiation. The average lifetime of a molecule of ozone is approximately eight days. Essentially all UV-C radiation and most UV-B radiation is continually absorbed in this cyclical process, which heats the stratosphere much in the manner of an “electric blanket,” meaning the blanket is heated by Sun, and not by the body under the blanket—Earth. Meanwhile, UV-A and visible sunlight pass through the atmosphere without being absorbed, warming Earth directly. When more ozone is destroyed than is created, the ozone layer is depleted. 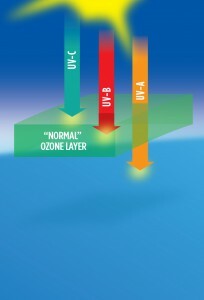 Less ozone absorbs less UV-B, allowing more of this very hot radiation to reach Earth’s surface. This allows the ozone layer to cool while warming Earth and increasing your risk of sunburn and skin cancer. Thus, the ozone layer not only controls average global temperatures, but it also acts as an atmospheric shield that protects life on Earth from the “hottest” and most harmful ultraviolet radiation from Sun. It turns out that this atmospheric shield is very fragile. In the 1960s, chlorofluorocarbon gases (CFCs) were manufactured widely for use as spray-can propellants, refrigerants, solvents, and even fire-retardants because they were very inert, meaning they did not interact chemically with other materials. By 1970, many types of paint, perfume, lubricants, cooking oils, etc. were available in spray cans, and soon the ozone layer began to be depleted, and the world began to warm. In 1974, scientists discovered that when CFC gases rise up into the lower stratosphere, they can be broken down by UV-B radiation. This process is especially effective in polar regions in the vicinity of polar stratospheric clouds, which form where temperatures are lower than minus 108oF. Depletion is greatest in late polar winter to early polar spring, as sunlight returns. A single atom of chlorine can destroy as many as 100,000 molecules of ozone through a catalytic process. In 1985, scientists discovered an ozone “hole” over the Antarctic in which the ozone layer was depleted by as much as 50%. Ozone was depleted less over the Arctic, only by 10 to 15% at mid-latitudes, and by very little in the tropics. Scientists worked closely with diplomats to draft the United Nations Montreal Protocol on Substances that Deplete the Ozone Layer, which limited the manufacture of CFCs beginning in 1989. 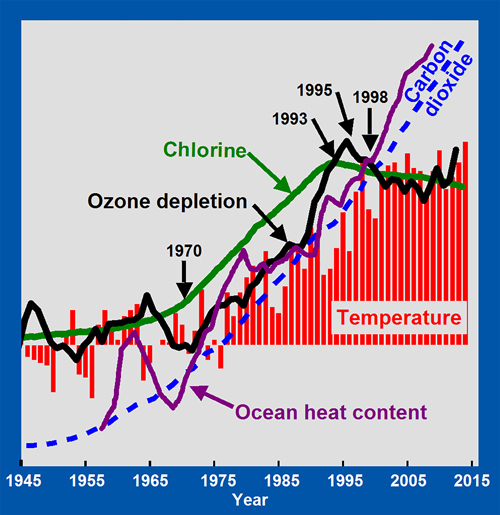 By 1993, the increase in the concentration of chlorine in the atmosphere stopped (green line). By 1995, the increase in ozone depletion stopped (black line). By 1998, the increase in mean surface temperatures stopped (red bars). Average global surface temperatures have remained essentially constant from 1998 through 2013. Because ozone remains depleted, excess UV-B is still reaching the oceans, causing ocean heat content to continue to rise (purple line). CFCs are so persistent in the atmosphere that their concentrations are not expected to decrease significantly for many more decades. Ozone depletion will therefore continue, as will the heating of the oceans and the melting of glaciers. Mankind unintentionally caused global warming from 1965 to 1998 and largely corrected the problem via the Montreal Protocol. 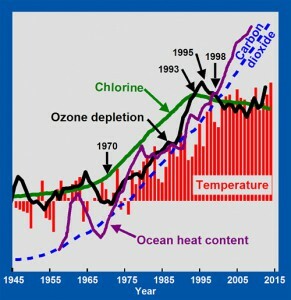 Note that atmospheric concentrations of carbon dioxide (blue dashed line) have increased exponentially since 1945, with no change in trend around 1970, or in 1998, when trends in temperature changed sharply. Greenhouse warming theory does not offer any direct explanation for these observed changes in temperature trends. The greatest global warming ever observed using thermometers, 12°F, occurred from 1951 to 2003 on the Antarctic Peninsula within the Antarctic ozone hole. This is also the greatest warming observed for this region in 1300 years. There was additional significant warming throughout Antarctica and in the Arctic. Amplification of warming temperatures in the polar regions has been widely observed and is fully consistent with ozone depletion theory because the greater the ozone depletion, as in the Arctic, the greater the warming. It is very difficult to explain Arctic amplification with greenhouse warming theory. In 1991, Mt. Pinatubo erupted in the Philippines, the largest volcanic eruption since 1912. In 1992 and 1993, concentrations of ozone at mid-latitudes reached the lowest levels observed since measurements began in 1927. Winter temperatures over northern continents increased locally by as much as 5oF and temperatures within the ozone layer decreased by about 0.7oF. Explosive volcanoes such as Pinatubo also eject megatons of water vapor and sulfur dioxide into the lower stratosphere, where they form a sulfuric acid aerosol, or mist, whose particle sizes grow large enough to reflect and scatter ultraviolet radiation. This causes a global cooling effect of nearly 1oF, typically for three years, which usually overwhelms the warming effect from ozone depletion, causing net cooling. Effusive volcanoes, typical of Hawaii and Iceland, on the other hand, extrude black, basaltic lava flows over large areas but do not explode much gases and ash high enough into the stratosphere to form aerosols and therefore have no net cooling effect. Basaltic lavas emit much larger amounts of ozone-depleting chlorine and bromine than explosive volcanoes do, so that the small eruption of Eyjafjallajökull in Iceland in 2010—the one that disrupted European air space for a couple of weeks—depleted ozone by as much as the far larger Pinatubo eruption, therefore having only a powerful global warming effect. On September 4, 2014, the little known volcano Bárðarbunga began erupting in central Iceland. By February 28, 2015, this volcano extruded basalts over an area of 33 square miles, forming the largest basaltic lava field observed in the world since the Laki eruption in 1783. This volcanic eruption appears to have had profound effects on weather, including making 2014 and 2015 the warmest years on record. For 8 months, starting in June 1783, Laki, in southern Iceland, erupted 3.5 cubic miles of basalt over an area of more than 200 square miles. Nearly 100 megatons of sulfur dioxide erupted into the troposphere was carried to Europe by the jet stream, forming a dry fog of sulfur dioxide that turned to acid rain, damaging vegetation severely from Iceland to Finland, to Italy. Temperatures in Europe increased 5.4oF in July compared to the long-term average and were 9oF lower than normal during the following winter in Iceland and in the eastern United States. This eruption caused nearly 23,000 deaths in England and tens of thousands more in mainland Europe due to respiratory effects and primarily due to famine. The largest effusive basaltic eruption of historic time came from Eldgjá in 934, erupting 4.3 cubic miles of basalt, covering an area of more than 300 square miles in southern Iceland. Extensive basaltic volcanism in Iceland from 11,750 to 9,375 years ago was intense enough and continuous enough to warm the world out of the last ice age. Explosive volcanoes, on the other hand, with their net cooling effect, appear to increment the world into ice ages when they occur with sufficient frequency, i.e., many times per century. Throughout Earth’s history, mass extinctions have been contemporaneous with extrusion of large basaltic lava flows. The larger the area covered by basalt, the larger the percent extinction, the greater the warming, and the more acidic the oceans became as massive amounts of sulfur dioxide were emitted by volcanoes on land and massive amounts of hydrogen sulfide were emitted by volcanoes on the ocean floor. At the end of the Permian period, 252 million years ago, climate changed so radically that 96% of all marine species and 70% of all terrestrial vertebrate species vanished. Ocean temperatures rose more than 14oF, nearly three times the rise in ocean temperatures at the end of the last ice age. At the same time, one million cubic miles of basaltic lava in Siberia covered an area equal in size to 87% of the contiguous United States. That is more than all of the contiguous 48 states except for Texas and Montana. The second greatest extinction was 201 million years ago when massive basalt fields formed throughout the Central Atlantic magmatic province as North and South America began to move westward away from Africa, forming the Atlantic Ocean. The third greatest extinction was 66 million years ago when massive flows of basalts, known as the Deccan traps, formed in India perhaps within 30,000 years. The giant meteorite that struck Earth during this time, was but an instant within a much longer period of dinosaur extinction. All of these extinctions were contemporaneous with major acidification of the oceans caused, in large part, by sulfur dioxide emitted from the basaltic lavas. The presence of ozone indicates where local heating of the atmosphere is occurring. Ozone concentrations vary rapidly, especially in late winter and early spring, having major effects on the basic distribution of air-pressure highs and lows and thus on weather. Ozone depletion tends to strengthen the polar vortex, causing the polar jet streams to meander more, slowing their speed of propagation and sometimes bringing blasts of cold air south, thus changing precipitation and weather over large areas. The eruptions of Eyjafjallajökull in 2010 and Grímsvötn in 2011 appear to have caused warming and drought in central North America and substantial warming of the North Atlantic ocean, leading to heavier rainfall in Britain. Maps of ozone throughout the world are produced daily using data from satellites and ground stations. Integrating these into meteorological models should significantly improve our understanding and forecasting of changes in weather. Computer models of climate typically calculate that there is more thermal energy contained in Earth’s infrared radiation absorbed by greenhouse gases than in the solar ultraviolet-B radiation that reaches Earth when ozone is depleted. Common experience, however, confirms that this is not true: you feel hotter standing in ultraviolet and visible radiation from Sun than you do standing outside at night with infrared radiation welling up from Earth’s surface. There has been a fundamental misunderstanding in physics about what radiant energy is and how it should be calculated. Natural philosophers and scientists have debated for 2400 years whether light travels as waves or as particles. New observations show that light and other forms of electromagnetic radiation travel simply as frequency, in a manner similar to the signal from your cellphone or a radio station, and that the thermal energy involved is simply equal to frequency times a constant, representing the energy of the atomic oscillators which are the sources of radiation. It turns out that the energy of ultraviolet-B radiation is actually 48 times greater than the energy of infrared radiation, confirming common experience. There simply is not enough energy involved with greenhouse gases for them to play a significant role in global warming. Greenhouse warming theory assumes that air is heated when there is an increase in the concentration of greenhouse gases. This fundamental assumption has never actually been proven in the laboratory. The only published experiment, done in 1900 by a reputable physicist, showed that the effect is minimal. Greenhouse warming theory also assumes that the heated air radiates energy back to Earth’s surface, and that this return flow of heat energy warms Earth. The problem with this is that the gas layers in the lower atmosphere that are responsible for this return flow are colder than Earth’s surface. Heat cannot physically flow from cold to hot. You do not stand next to a cold stove to get warm. Finally, the assumption in greenhouse warming theory that radiation from Earth ultimately warms Earth is preposterous because electromagnetic radiation from a thermal body cannot warm the same body. If it could, then all material objects would spontaneously heat up until they would ultimately melt or vaporize. Obviously, this does not happen. Many scientists assume that warming of air slows the rate at which Earth cools, but in the troposphere, far more heat is lost by means of convection in weather and storm systems than by means of radiation. While most scientists today are convinced that greenhouse warming theory is well understood and proven beyond a reasonable doubt, new observations show that it is, in fact, physically impossible. One of the strengths of science is that over time, it is self-correcting. Contrary to a currently popular mantra, science is never settled. We can develop all sources of fossil fuels safely, provided we control air pollution and environmental damage. Currently, air pollution is killing more than one million people per year, primarily in Asia. Increasing amounts of inexpensive energy are required to maintain our current lifestyles and to fuel growth for developing countries. 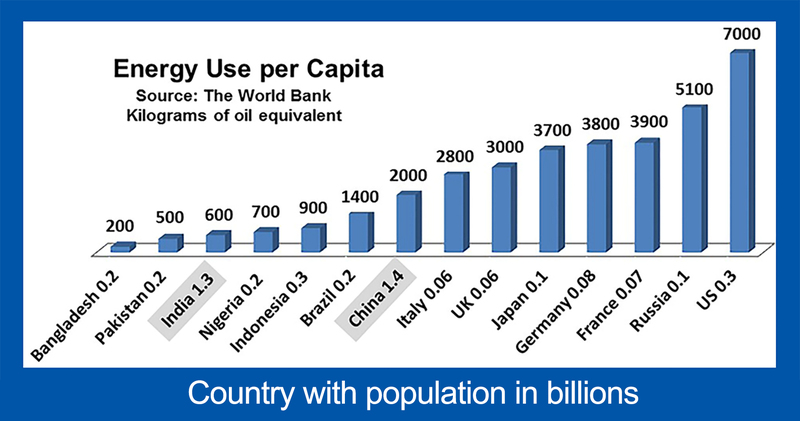 The average American utilizes 35 times more energy than the average resident of Bangladesh, 12 times more than the average citizen of India, and 3.5 times more than the average citizen of China, and those three countries make up 39% of world population. Ozone is expected to remain depleted for many more decades, causing the oceans to continue to warm and glaciers to continue to melt. The longer ozone remains depleted, the warmer the oceans will become, and the longer Earth’s warmer climate will persist. The only proven way to cool the climate back to 1965 levels would be by means of a rapid sequence of explosive volcanic eruptions. Until that happens, we must simply adapt to a world that is one degree warmer. We do need to protect ourselves from increased risk of sunburn and skin cancer. We should cover up more when in direct sunlight for extended periods of time, especially at high latitudes. We also need to protect our belongings from increased risk of deterioration and from color fading when left outside. We should also expect improved public policy, illuminated by better scientific understanding of the technical issues. Peter Langdon Ward, BA Dartmouth College, PhD Columbia University, worked 27 years with the United States Geological Survey studying volcanoes, earthquakes, regional geology, and plate tectonics. He has also specialized in educating the public about how to live more safely with natural hazards such as devastating volcanic eruptions and earthquakes. He helped develop and lead the National Earthquake Hazard Reduction Program, chaired a committee at the White House on effective disaster warning, and won two national awards for his efforts. In 2006, while retired, he discovered something that just did not make sense about climate change. He has worked full time trying to understand how volcanoes could both cool and warm climate, what radiation and radiant energy are, and how solar radiation is absorbed to form Earth’s atmosphere. He ended up carefully reexamining each of the key assumptions made in developing greenhouse gas theory. In this well illustrated book, he invites you to join him on this fascinating quest, looking at a wide variety of data.